At a press conference on June 1, 2015 in Hong Kong, the Shaw Prize Foundation announced that this year's Shaw Prize in Mathematical Sciences is awarded in equal shares to Gerd Faltings and Henryk Iwaniec for their introduction and development of fundamental tools in number theory, allowing them as well as others to resolve some longstanding classical problems. The prize consists of a monetary award of one million US dollars. From the prize justification of the Shaw Foundation: A polynomial equation of degree n in one variable with coefficients which are rational numbers has just n complex numbers as solutions. Such an equation has a symmetry group, its Galois group, that describes how these complex solutions are related to each other. 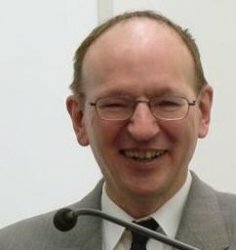 Prof. Dr. Gerd Faltings, born in 1954, studied mathematics and physics at the University of Münster where he received his Diploma and Ph.D. in 1978. After visiting Harvard University from 1978-1979, he was Assistant at the University of Münster from 1979-1982, completing his Habilitation in 1981. Following Professorships at the University of Wuppertal from 1982-1984 and Princeton University from 1985-1994, he became director of the Max Planck Institute for Mathematics in Bonn in 1995. He has already received numerous awards for his work: the Fields Medal in 1986, a Guggenheim Fellowship in 1988, the Gottfried Wilhelm Leibniz Prize in 1996, the Karl Georg Christian von Staudt Prize in 2008, the Heinz Gumin Prize in 2010, and the King Faisal International Prize for Science in 2014. The Shaw Prize honors individuals who have achieved significant breakthroughs in academic and scientific research or applications and whose work has resulted in a positive and profound impact on mankind. The prize is awarded annually in the three fields: Astronomy, Life Science and Medicine, and Mathematical Sciences,. This is the twelfth year that the Prize has been awarded and the presentation ceremony is scheduled for Thursday, 24 September 2015.